This Creamy Tuscan Garlic Chicken recipe is a restaurant quality dinner but so simple to make! 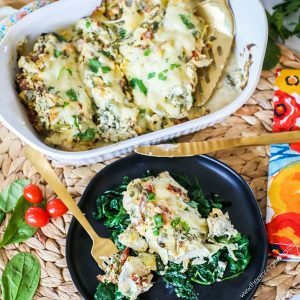 It has so much flavor, it will remind of of something you would order at an Italian restaurant, but since it only has a few ingredients and is baked in one casserole dish it can be prepped and in the oven in as little as 10 minutes. The flavors of tender chicken smothered in a mixture of creamy cheese, spinach, sweet sun dried tomatoes, tangy artichokes, and of course, perfectly roasted garlic will have your friends and family cleaning their plates and asking for seconds! To me this recipe is everything you want in a weeknight dinner. I would put it up against a similar dish from a restaurant any day, but it is still easy to make, and for the win- easy to clean up. This Creamy Tuscan Garlic Chicken is the kind of dinner time unicorn that you don’t often find. We have made this several times now and it is one that we always fight over who gets to eat the leftovers. Now of course I usually win because I hide them in the back when I clean up, but sometimes I am nice and I split them up too. This Creamy Tuscan Garlic Chicken is great when reheated and also works really well using the leftovers to make some new dishes. For example, you can have the Creamy Tuscan Garlic Chicken with a couple of sides the night that you bake it, then later in the week you can us the leftovers to top some tortellini, or s big hearty salad. I love meals that can pull double duty like that! I will go into more detail at the bottom of this post on other meals you can use your leftovers for. If you love this whole super easy, one dish, dinner thing, then make sure to check out my other easy baked chicken recipes! You can also find a non-creamy version of this Tuscan Garlic Chicken here. This dish is full of creamy goodness and bold Italian flavors. It is fairly hearty all on it’s own since it is loaded with so many great veggies like spinach, artichoke, and sun dried tomatoes. You can serve it simply for a quick weeknight meal, or get a little more elaborate if you are having guests, but either way this Creamy Tuscan Garlic Chicken will shine. Mashed potatoes– these are my husband’s favorite! Garlic toast- All Italian meals go great with garlic bread right?! Bonus, my kids devour it! You can pick one or make it with 2-3 side options from the list. This dish is great as simple or elaborate as you want to get. If you have a serving option that you love that I missed, please let me know in the comments below so I can give it a try! As I mentioned, this Creamy Tuscan Garlic Chicken is so easy to make which is one reason it is such a great recipe. I am going to walk through it here with you below so I can answer any questions that might come up, but you can also just skip down to the bottom of the post for the full, printable, recipe card. If I by chance left your question unanswered, feel free to leave me a note in the comments below and I will try my best to answer it. 8 oz cream cheese, softened- I use regular Philadelphia Cream Cheese when I make this. You can also substitute low fat or neufchatel cheese here. 1 can (14 oz) quartered artichoke hearts, drained- I get the ones that are not marinated, however if you have ones that are, it will work too. Since they are drained, not too much of the flavor transfers. 1/2 cup jarred sun dried tomatoes, chopped, plus 1 tbsp oil from sun dried tomatoes- I use the sun dried tomatoes packed in oil. I like to chop the sun dried tomatoes so that they can more evenly distribute throughout the dish. Also, they can be a bit chewy so it makes them easier to eat when they are small. The extra table spoon of oil from the tomatoes helps distribute the rich sun dried tomato flavor throughout the dish. 4 cloves fresh garlic, pressed- I really prefer fresh garlic over jarred. If you want a short cut here, many stores sell it pre-peeled in the refrigerated section of the produce department. Since garlic is such an important flavor in this dish, I think fresh really takes it to the next level. Mix together the cream cheese, artichoke hearts, sun dried tomatoes and oil, spinach, garlic, and black pepper until combined. You will want to make sure that the cream cheese is very soft before mixing. If it is not soft it will not combine well with the other ingredients. If you need to soften it quickly, you can put it in a microwavable dish and the microwave it for 30 second increments, stirring in between until it is smooth and creamy. Lay the chicken breast flat in the baking dish. If your chicken is thick, I recommend cutting it so that the thickness is cut in half. You can also cut it in chunks, or use chicken thighs, or chicken tenderloins. If you change the cut of meat or the size of the meat the cooking time will change as well. Spread the cream cheese mixture over top of the chicken then sprinkle the mozzarella cheese over it to finish. Bake for 40-50 minutes or until the chicken is cooked through (165˚F internal temp.) I do not cover this dish in my oven when baking. I like to leave it open so that some of the extra liquid can evaporate and to let the top of the cheese get crispy. With that said, each oven cooks differently based on how big it is, how it is powered, and the climate you live in. I recommend that you keep an eye on this the first time you bake it, and if you notice it getting more browned than you like, loosely cover with foil during the remainder of the cooking time. Stuffed shells- Shred the chicken, then pack the leftovers of this dish into cooked large pasta shells and place in a baking dish. Cover with alfredo sauce and bake until hot and bubbly. Wrap- Place a layer of hummus, fresh spinach, and this creamy tuscan garlic chicken in a wrap for a delicious lunch. Panini- Slice the chicken and place between two pieces of italian bread and then cook it up panini style. It is perfect to pair with a bowl of soup! I really hope that you enjoy this Creamy Tuscan Garlic Chicken (and the leftovers!) as much as we do. It is always such a treat to have a meal as delicious as it is easy. This Creamy Tuscan Garlic Chicken is as delicious as any restaurant, but super quick and easy to make! 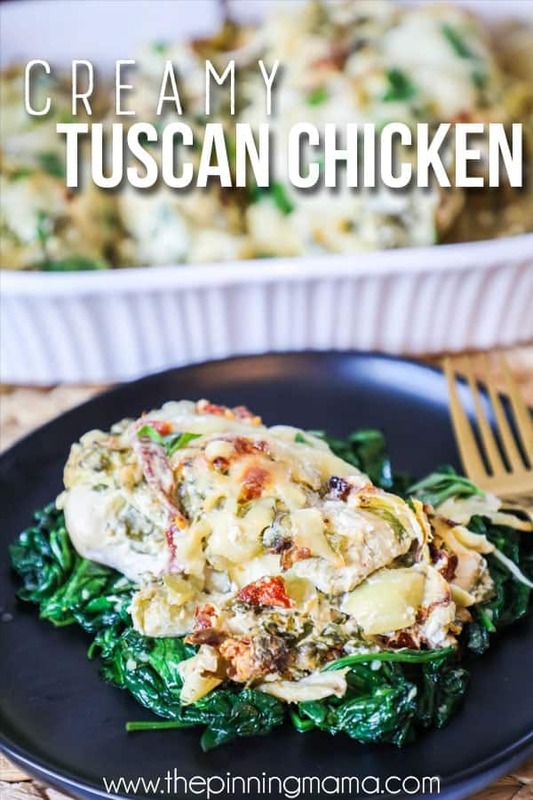 The creamy mixture of spinach, sun dried tomatoes, garlic, artichokes and cheese makes the chicken so flavorful and delicious. Recreate the leftovers with pasta, a salad, or stuffed shells to make this recipe pull double duty. Mix together the cream cheese, artichoke hearts, sun dried tomatoes and oil, spinach, garlic, and black pepper until combined. Lay the chicken breast flat in the baking dish. Spread the cream cheese mixture over top of the chicken then sprinkle the mozzarella cheese over it to finish. Bake for 40-50 minutes or until the chicken is cooked through (165˚F internal temp.) Loosely cover with foil during cooking if the top gets to be more browned than you like.